KFAR SABA, Israel, Feb. 5, 2019 /PRNewswire/ -- Seth L. Sherman, MD, a sports medicine orthopaedic surgeon at Missouri Orthopaedic Institute, recently became one of the first American surgeons to enroll patients in a clinical research study towards FDA approval of CartiHeal's new knee cartilage repair implant. Agili-C™ is a novel implant designed to help patients with knee-cartilage defects to regenerate their own healthy cartilage. Dr. Sherman is one of 15 primary investigators in the United States conducting the FDA-IDE study deigned to demonstrate the superiority of this implant over the current standard of care - microfracture and debridement. "We are thrilled to be on the leading-edge of orthopaedic sports medicine and joint preservation," Sherman said. "In the US, there are limited options for off-the-shelf cartilage repair technologies that can be used by sports medicine surgeon performed during a single surgical procedure. Benefits of this technology include its relative low cost, ease of use, without burning future bridges, and strong previous basic science and clinical track record." Cartilage damage is a common knee problem that occurs in patients of all ages. It can happen as a result of an injury, like a blow to the knee, or due to wear and tear over time. In any case, it causes knee swelling, stiffness, and pain that can reduce function and decrease quality of life. "Often In studies like this one, we can enroll only a very strict sub-set of young, active patients with a single, isolated cartilage defect," said Dr. Sherman. "In reality, that's not the typical patient we see every day. 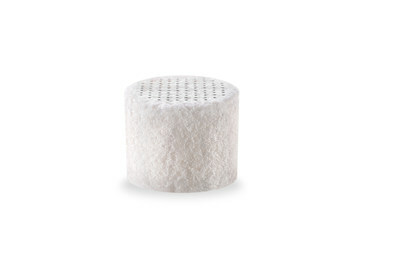 This implant is different because it's medically indicated for a wide range of situations including patients with multiple cartilage defects and even those with mild-moderate osteoarthritis. We can use it in patients who are in their 20s or in those who are in their 60s. This versatility allows us to find more patients who may benefit from this procedure." Those who qualify for the study are randomly assigned either one of the traditional surgical options or the new implant. So far, Dr. Sherman has enrolled four patients in the study and more cases are planned in the upcoming weeks. Says CartiHeal founder and CEO Nir Altschuler: "We wish to congratulate Dr. Sherman for enrolling these four initial patients. The enrollment rate is exceeding our expectations, with over 130 patients enrolled in both US and OUS centers since the study's initiation in October 2017. We look forward to a fruitful collaboration with the Missouri Orthopaedic Institute, and to benefit patients suffering from a variety of cartilage lesions, who currently have limited options." The Missouri Orthopaedic Institute is central Missouri's largest freestanding orthopaedic center, as well as the region's most comprehensive orthopaedic surgery center. The Institute's expert orthopaedic surgeons, nurses, rehabilitation staff and other health professionals offer patients a full range of care in a single location. The Missouri Orthopaedic Institute houses approximately 400 staff, including 34 physicians who specialize in sports medicine, joint replacement, pediatrics, hip and knee, foot and ankle, shoulder, hand, spine, oncology and trauma care. For more information, visit http://muhealth.org/MOI. CartiHeal's cell-free, off-the-shelf implant is CE marked for use in cartilage and osteochondral defects. Agili-C™ was implanted in over 400 patients with knee, ankle, and great toe cartilage lesions in a series of trials at leading centers in Europe and Israel - treating a broad spectrum of cartilage lesions, from single focal lesions to multiple and large defects in osteoarthritic patients. In the United States, the Agili-C implant is not available for sale - it is an investigational device limited for use in the IDE study.